Many travel and study abroad programs include a service component, but something particularly special about service with LeadAbroad is the application. We work hard to create service opportunities for our students that not only allow them to help out in the local community, but to go beyond by building relationships with these locals and learning integral parts of their culture to better understand why we serve. Through immersing ourselves in these communities, we help our students gain an understanding of the importance of being a global citizen. On our Cape Town programs, we serve in a community called Sir Lowry’s Pass where we set up an after-school camp for children: reading, playing sports and games, making arts and crafts, and more. Our students also meet with host families each day of service week, which gives them the opportunity to connect with locals through deep conversation in a more personal setting. 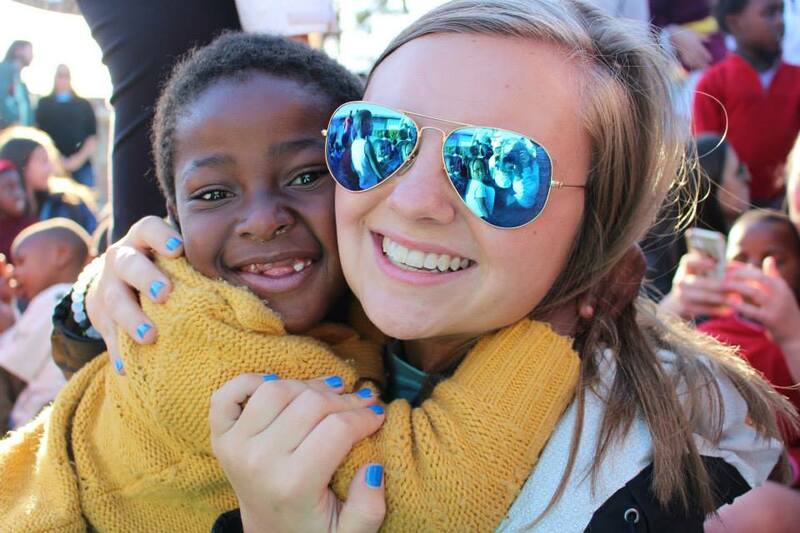 Community Leader Darby Enright, a senior social work major at the University of South Carolina, maximized her time in Sir Lowry’s Pass on LEAD Cape Town 2015 and learned so much about herself and others. Everything she learned she can credit to one South African word: Ubuntu. Read more below to see Darby’s story. Ubuntu is an ancient African word that represents a lifestyle philosophy: “I am because you are.” I had never heard of nor seen this word prior to traveling to Cape Town, South Africa with LeadAbroad, and it is now a word that I live by. The people of South Africa live with such compassion and humility towards others; simply interacting with them is absolutely incredible and heartwarming. So, what does Ubuntu mean to me? 1. Ubuntu means being selfless. Too often we think solely of ourselves and only about what would benefit us directly, but the philosophy behind Ubuntu takes a different route. We as individuals and global citizens are all connected, and our actions impact those around us. LeadAbroad incorporates the Ubuntu philosophy into their study abroad programs by providing students with a service component that positively affects a local community. Being able to serve others by simply providing them with my time and affection while in South Africa was life-changing. When you give yourself up to help and encourage others- that is when you are living out the Ubuntu philosophy. 2. Ubuntu means finding happiness in the simple interactions with others. Exchanging a smile or hug with another person can affect them in ways incomprehensible. The children I interacted with while in Cape Town were searching simply to feel loved, and being able to give someone else that feeling is a gift in itself. 3. Ubuntu means giving your time to participate in something that will positively affect another person. Go out and serve. We tend to live in a little bubble and think that our problems are negatively consuming our lives and that things are just so terrible. But take a step outside of your comfort zone and give your time to help improve the lives of others, those who are truly struggling. Your one-hour conversation or simply wrapping your arms around someone can completely change their life and their mindset. Most of the time we view service as helping others, but in actuality, in participating in service we are most of the time the ones who are helped. I came to Africa thinking that Africa needed me, and I left with the realization that I needed Africa. The compassion and love that those people pour into their daily lives changed my mind and my heart forever. Be kind, always, and live for something bigger than yourself. Darby was able to learn and live out the spirit of Ubuntu through listening to her host family’s stories, caring for the children in the community, and submerging herself in their culture of Ubuntu by practicing this lifestyle and bringing it back home with her to the United States. At LeadAbroad, we not only encourage you to serve others: we encourage you to learn and grow from your service experiences. We challenge you today to do something great for your community and to encourage others to do the same! Why? Because of Ubuntu: people are people through other people. Stay tuned to read more about service in each of our locations, including more ways that we learn about and live out Ubuntu!